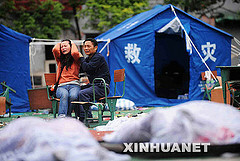 Post-quake mourning, what about you ? It looks like there has been a lot of excitement in the micro-blogosphere recently since Robert Scoble relayed instructions the Chinese government sent to the Chinese web-sites requiring them to shutdown all entertainment channels during the 3 days national mourning in memoriam the victims of the recent earthquake. A lot of people commented, criticizing the Chinese government and talking about violation of free speech and human rights, etc. Ladies and gentlemen, on your own terms you are free and have free speech. What do YOU intend to do to commemorate the confirmed death of more than 35,800 people (expecting 50,000) or to help the 5 million people who do not have a home anymore ? This entry was posted in Random Thoughts and tagged china, earthquake, freedom, mourning on 2008-05-19 by Claude Vedovini.